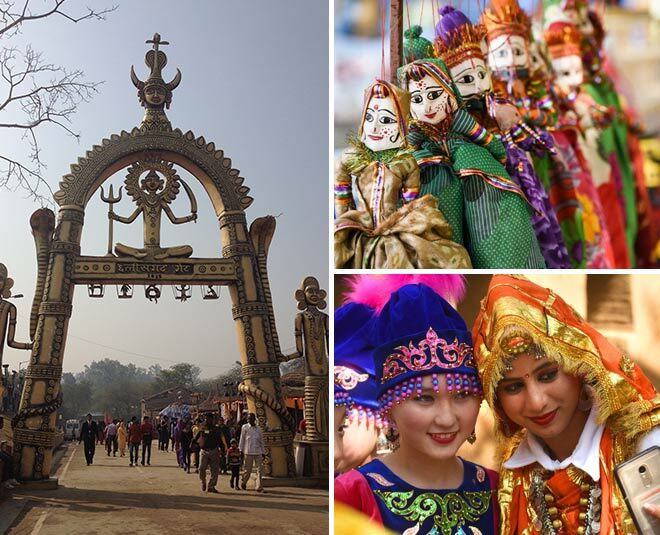 A kaleidoscope of colours, music, aroma, entertainment and more await visitors at the beautiful Surajkund International Crafts Mela that’s the biggest crafts mela in the world. With an aim to promote all things ethnic, the Surajkund Fair is organised every year to provide an excellent arena for the talented craftsmen, artisans and entertainers across India and the SAARC nations. Fair At The Sun Pool! Situated 8 kms away from Delhi in Faridabad, Surajkund or Sun Pool was built by Raja SurajPal in 10th century AD. The place became famous ever since the colourful Surajkund Crafts Mela was started by the Haryana Tourism in 1987. 1st to 15th February from 10 am to 7 pm. There is 50% rebate on the entry tickets for the differently-abled, senior citizens, serving soldiers, students as well as war widows and their dependents. Watch: Folk performances at the open-air theatre ‘Natyashala’ and the various Chaupals. Lively skits and plays on various issues performed by the youth plus stunts by tribals and kavi sammelans. Buy: All handcrafted materials showcasing the immense talent of Indian craftsmen and that of other nations. Textiles, home decor items, organic personal and beauty products, organic spices and more. Take your pick from brass ornaments and celadon ware of Thailand, bunni dupatta of Gujarat, Kashmir’s chikri woodcraft, lanterns from Egypt, fabrics of Sri Lanka or spices of Rajasthan. But do bring along or buy big carry bags as you will surely go on a shopping spree. Play: Joyrides, adventure sports, places of amusement, helicopter joyrides. Eat: Delicious delicacies from various regions, stuff that you won’t find in food courts or neighbourhood streets, exotic flavours and textures that will blow your mind. Get down at the Badarpur metro station and take a cab or bus to reach the destination. So what are you waiting for? Just book your tickets and head out with your friends and family to have an eventful weekend at the Surajkund Crafts Mela. Want to know more about upcoming events in your city, exotic destinations or travel tips? Then stay tuned to Her Zindagi.